For a 'Map of Funan' click the link or the image. Phnom Chhnork Temple in Kampot Province. The image top right shows Wat Ashram Moha Russei, a hindu temple of the Funanese time on Phnom Da. 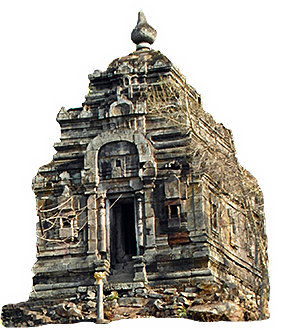 The temple represents clearly Javanese influence. The image bottom left shows a stone tablet with a Funanese inscription in the National Museum of Angkor Borei. The search for Funan leads us back to the very early times of civilization. 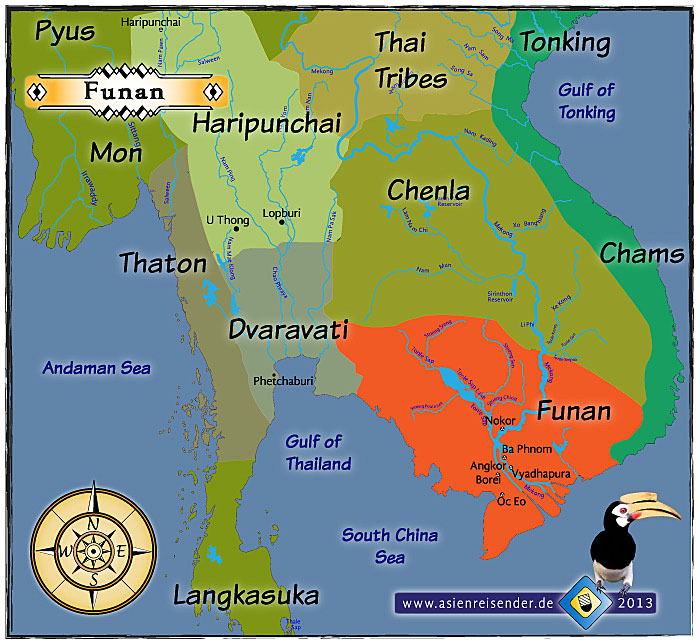 Funan is considered as (one of, if not) the first civilization which took place in Southeast Asia from the 1st century CE on, and it was basically located in the fertile mouth of the Mekong River and the wider area around. 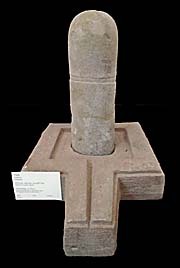 It is also part of the first stage of Cambodian history, for it were probably people of the Indian Khmer/Mon group (or from Austronesian origin, as other historians argue, or a more mixed-up multi-ethnic people) who settled down and founded a first settlement of at least local significance and who evolved technologies who were furtherly developed and led to the civilization of the classical empire of Angkor with the grand architecture of Angkor Wat and Angkor Thom and their sophisticated canal system for irrigation and transport. 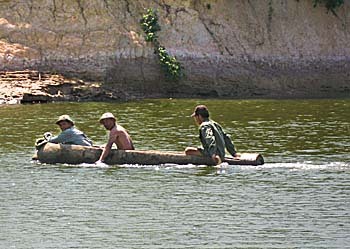 The lower Mekong area is inhabited by humans since a long time already. Estimations vary between tens to hundred thousands of years. What kind of people the first inhabitants were remains unclear. Probably there was a first immigration of homo erectus, before homo sapiens followed. Stone-age remains are the silent witnesses of the presence of these humans. It seems that Funanese authorities already minted coins. 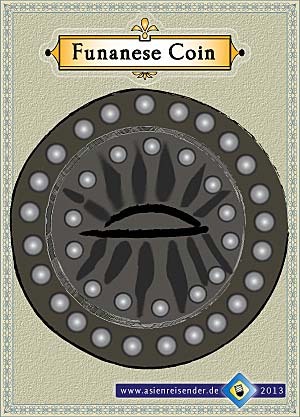 Here you see a sample of a Funanese coin. It depicts a rising sun. Others show motives of the legendary Hamsa bird, what is in the hindu cosmos Shiva's vehicle and a mythical variation of a goose or swan. 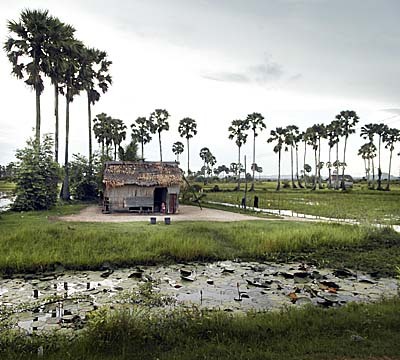 It's also not clear if these very first people were the ancestors of the Khmer People, but historians suppose that people from the Khmer-Mon group lived here since the 3rd millenium BCE. However, these first people were nomads, hunter-gatherers who roamed the forests and along the swampy rivers on the search for game and edible vegetables. Probably some of these groups of early people practised a slash-and-burn agriculture as the hill tribes of Southeast Asia, for example the Khmer Loeu people of Cambodia, do still today. It must have been a long transformation period from the hunter-gatherer's life to a settlement-based life with permanent agriculture and animal husbandry. The lower Mekong therefore was a good base, because it's many sidearms provide an abundance of fish as a great source of proteins and basic food source. Besides, rivers were the first routes in history, used as waterways. The usage of copper and bronze tools was invented at around 1500 BCE. A thousand years later iron tools and weapons were invented (or the knowledge was imported from India or China) and agriculture had evolved more efficiently. At this time there were probably a number of petty principalities in existence, lead by local chieftains. There was no overheading state existing, unifying these settlements. As mentioned, the ethnicity of those people is still not clear. There is no hard evidence that they were Khmer. 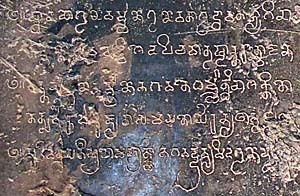 The first stone inscriptions done in Khmer language appear from the 7th century on. So, it could be that the inhabitants of these early settlements, including the first larger, state-organized civilization of Funan, were Chams, or even other people who became extinct later or were pushed out by a following wave of immigrants. A medley of Southeast Asia's ancient civilizations in the first millennium CE. The focus is set on Funan. In the time of it's largest extend it stretched until deep into the Malay Peninsula facing the shores of the Andaman Sea / Indian Ocean. Clear is therefore that the early inhabitants at the beginning of the 1st century CE were highly influenced by Indian culture. The oldest civilization which became of overregional influence and left a somewhat greater amount of traces was Funan. 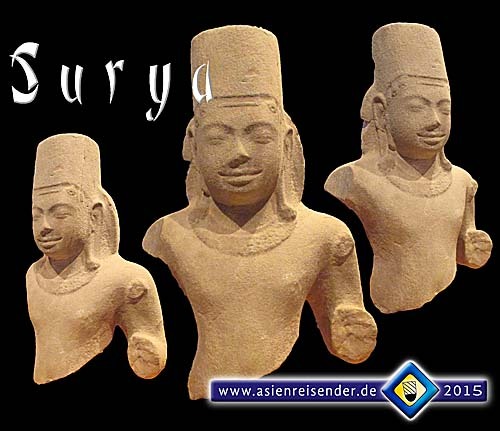 Funan is seen as the first civilization in Southeast Asia. It can barely be seen as an empire, for it was probably rather an alliance of towns along the lower Mekong River Delta than a centralized state. It later spread out it's influence, stretching over greater parts of nowadays Vietnam, Cambodia, Thailand until the borders of Burma/Myanmar and to the Isthmus of Kra. 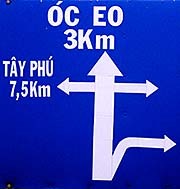 The parts of Funan far away from the Mekong Delta were merely tributaries. Again, Funan was far away from being an integrated state, as the term 'state' in it's modern version implies. Some historians suggest that the regional civilizations were built by waves of immigrants who came from India. There is no proof for this hypothesis, but it's likely so, for Funan's close relatedness with Indian culture supports the idea. It's also likely that merchants from India, Malaya, Java and China settled down in Funan's towns in the lower Mekong area, who were of strategical importance as a trade center and stopover on the seaway between India and China. Although the ethnicity of the Funanese is unknown, there are hints that they might have been proto-Khmers. A Funanese king appears in Chinese records as Fan Shih-Man; though this name is clearly a Chinese derivate for his original name. If this Fan (Shih-)Man stands for 'Varman' (varman, Khmer = 'protector' as it appears in many later royal Khmer names) it would be a clear sign for his Khmer ethnicity. The Funanese religion was dominated by Indian Hinduism, which was reflected in the typical religious buildings and their architecture depicting the Hindu cosmos. The Hindu religion was blended with local superstitions. There were also pieces of early Buddhist art found from this time. The Funanese performed the construction of an extended canal system, what requires an organized, say supplied working force of a bigger size over a longer time and advanced planning capabilites. These canals were built rather as a drainage system for an excess of water as a flood prevention than as an irrigation system as it was the case later in Angkor. Funan can be seen as the place where the people made their first large experiences with canal building, which was later used and sophisticated in the Angkorean irrigation system. The canals also served as an extended transport system. The Mekong River, it's tributaries and the artificial canals were full with crocodiles at the time, as the Chinese records tell. 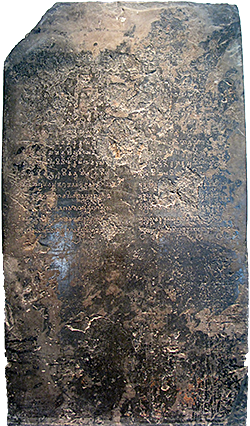 Part of a sanskrit inscription on a Funanese stele of the time around 450 CE. It was found in south Vietnam and is to see in the museum of history in Saigon/Ho Chi Minh City. The Funanese civilization was a literate one, and Chinese visitors in the 3rd century praised their libraries. The books were written in sanskrit language. But, unfortunately, as it is the case with the Angkorean literature of later centuries as well, all the Funanese books haven't stand the test of time. Nothing of it is left, not a single piece. The Chinese envoy Zhou Daguan in Angkor Thom in 1296/97 reported that the Angkoreans prepared palm leaves with a black paste as a cover and then scribbled their writings into it with a bamboo stick or somewhat alike. Might be that the Funanese already used the same technique. 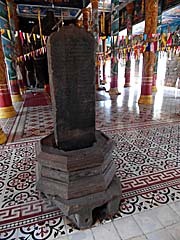 The Funanese stone inscriptions are written in Indian sanskrit as well. It's even not clear how the Funanese called themselves; 'Funan' is actually a Chinese word as well. Chinese chronicals also give record that the Funanese went naked in their towns. So, the civilizational level apparently wasn't that high. The people lived already somehow similar as they lived over the whole two thousand years since then and in many cases do still in Southeast Asia. 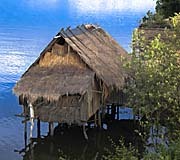 They built wooden stilt houses and fed from rice, fruits, vegetables and river fish. At a certain point they started wearing loincloths, and performed cockfights. Interestingly historians describe the Funanese society as a very stratified one. Slavery was an important part of it. So, we can assume that the Funanese sent armed troops into the wider surroundings of the settlements to catch and enslave tribal people. It is also thinkable that there was an established ruling class of ethnic Indians who dominated over a local population which was ethnically different. The ethnic Indian element was then reinforced by waves of immigration, while Indians were placed into key positions of the state institutions. Chinese sources from the mid 3rd century describe Oc Eo, where was a king named Jayavarman living in a walled palace. Funan falls perfectly in the description of the Oriental despoty (Karl A. Wittfogel), where a king in total power ruled over the working force of the city state. They first built a large irrigation system, which was extended as flood control and later also as a transport system. They learned to build walls and walled their places and learned so constructing temple buildings. All these projects required a centralized, decision-making authority whose power was based on armed forces. Funan became significant beyond it's limited borders by having talented seafarers. Funan was in contact via searoutes and trade networks with far away India, Persia and China. There have even been Roman coins found in one of Funan's towns, Oc Eo, who have passed over the long distance, changing through many hands until they arrived in the Mekong delta. In later centuries the Funanese payed tribute to the Chinese empire. Since it's not clear if Funan was a unitary state, the question of it's capital is hypothetically. 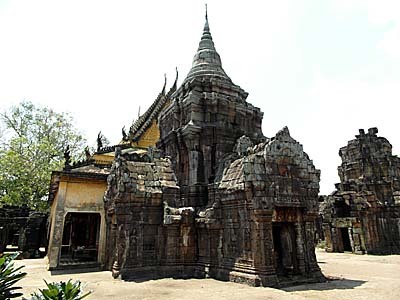 If there was a capital, Banteay Prei Nokor (Kampong Cham) is one of the possible locations. Other Funanese locations are Vyadhapura, Angkor Borei, Prey Veng and Oc Eo. In the 4th century Funan fought a war in the Chinese province of Tonkin (nowadays north Vietnam). Seems they had bad luck there, because from 357 CE on Funan became a tributary vassal of China. For the year 539 CE an Funanese king called 'Rudravarman' by the Chinese appears in Chinese records. He was remarkable for he made the Chinese emperor the gift of a living rhinoceros. His name also indicates Khmer ethnicity. For the time after that the records on Funan are thin. Many historians believe that the decline of Funan came with the rise of a rival, Chenla. 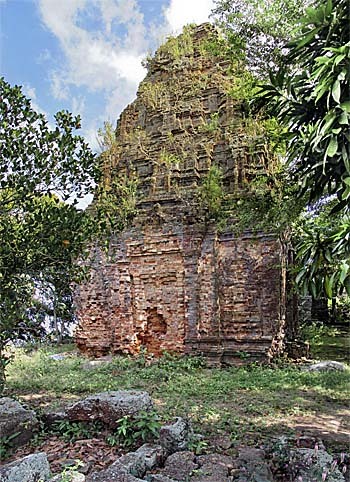 The small and almost completely unknown pre-Angkorean sanctuary on Phnom Bayang in south Cambodia has been built as a victory monument after an army of Chenla defeated Funanese forces. Chenla's original name is as well unknown as that of Funan, it's also a Chinese word for a foreign civilization. Though, there is little known about Chenla as well. Might be that the decline of Funan was just a relative one, a slow process, combined with the emerge of other petty principalities. Nevertheless, it came to an end in the 7th century. The people of the time who lived in the Mekong delta can now clearly be identified as the ancestors of contemporary Khmer People. In the 8th century there happened a Javanese invasion into the Mekong delta region, which forced the Khmer civilizations into a vassal status. According to an Arabic merchant the Javavese king Sailendra sent once an army for punishing a Khmer vassal king, who had provoced him by demanding his head on a platter. The Khmer king's head was then instead sent on a platter to Java.